Super Bomberman R - A Multiplayer Explosion Of Fun - Nintendo Switch Review — GamingWithSwag.com - Dads By Day, Gamers By Night. High Level Premise: The classic multiplayer action you love is back on the Nintendo Switch. Graphics/Style: Classic Bomberman retro style with a splash of high definition. Story: Emperor Buggler has taken control of the 5 planets of the starry sky solar system, it's up to the Bomberman clan to regain control and save the universe! Time Commitment: A single level will take about 10 minutes, multiplayer matches tend to last anywhere between 5 and 10 minutes depending on the scenario chosen. Value: High, the multiplayer is what sells this game. Favorite Element: Having up to 4 people play on a single Nintendo Switch console in portable mode. Connect two consoles together for 8-player mayhem. Fixed a bug in which the proper wording was not displayed when certain network errors occurred. The strength of the Five Dastardly Bombers on the Story Mode have been adjusted. The difficulties of Beginner and Normal have been reduced, making it easier to beat them. If you continue a certain number of times in the Story Mode, you will be able to continue without paying any more gems. That's an insane amount of fixes that have occurred since launch. It's good to see that Konami is continuing to support their launch Nintendo Switch title. Providing some additions like extra battle maps and items is pretty awesome as well. For as much bad press Konami has had in the past year, they really have been treating the consumer right on this one. Konami has also announced that there will be future DLC for Super Bomberman R such as additional characters based on other classic Konami properties like Castlevania, Gradius, and Silent Hill. The game is pretty much what you would expect, go it alone or bring a friend in co-op mode to battle through over 50 levels collecting powerups and defeating giant bosses along the way. Just like previous Super Bomberman games, the zones aren't just flat levels. These are multi-tiered with different shapes and pathways to explore. If you are like me, this causes you to want to check out what is behind those bricks over in that corner, because it might hold a cool item. The graphics are extremely well done, especially now that the frame rate has been improved by the patch a few weeks ago. This and the controls were two big concerns of most reviewers that published their review on launch, but that is no longer a concern. Animations are fluid, and the controls have been refined to give the tight controls that veterans of the series have come to know. Your standard powerups apply like roller skates to move faster, or the ability to kick your bomb out of the way. Some new ones are there too, like spiked bombs which pass through just about any block. The campaign will seem kind of short to veteran players, but the real value in Super Bomberman R is the multiplayer modes. Play online or battle on your Nintendo Switch, the game now features 12 battle mode maps, and up to 8-players at one time. (Note to play 5-8 players locally, you will need two Nintendo Switch systems.) There is a league mode where you can go online and ascend the ranks of Super Bomberman R and play against people all over the world. As you win these ranked matches, you earn Battle Points (BP) to increase your level and gain the ability to join higher leagues with more experienced players. 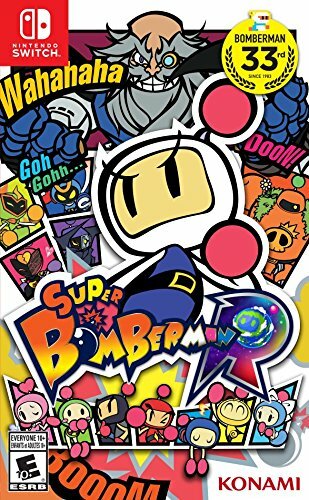 Overall, if you are a fan of the series, and plan on playing some multiplayer, you will not be disappointed with Super Bomberman R. If you own a Nintendo Switch, I highly recommend you add this classic to your library as soon as possible.